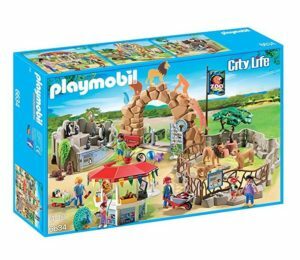 Your kids will love spending days in a row in a zoological garden with this Playmobil Large City Zoo Set (Model # 6634). This is a large playset that takes your kid into her adventure in the wildlife park. Animal lovers would surely be delighted with this set because of the mini figures and accessories included in it. Children will undoubtedly spend most of his time feeding animals and guide the visitors around the zoological garden. With this playset at home, there’s no need for you to ride into the city and spend a day in a real zoo. Want to expand you Zoo? Add Penguins, Baby Giraffe with Zookeeper, or even Dolphin Basin – all from by Playmobil! 2 What Does This Zoo Playset Include? Animal lovers would surely love this set! Your kids will have a blast at the different things they can do at the zoo. This set is also full of fun-filled activities that your child and her friends can enjoy together. The detailed miniatures are gonna make their make-believe play seem a lot more realistic. If you have a kid who loves animals and loves to go to the zoological garden every once in a while, then I’m telling you to better get this playset and let them enjoy Zoo Day in your own home! There are plenty of things that children can see in there. Take the trip anytime you want to with this Large Zoo set. This is the perfect play set that would keep kids busy. Take a look at the map before you start exploring so that you can plan your route through the zoo. You will see the caretaker feeding the animals as you stroll with the baby and that naughty boy. Watch over that kid, or else he might be showing mischievous tricks. Adult and baby animals can be found in their respective enclosures where children can look at them while the caretakers feed them. To catch them eating, you can look at the feeding times on the adjustable clock. After a day of fun at the zoo, go to the souvenir shop and pick something before you go. A large toy set for multiple plays. Your house is gonna be quite a madhouse if your kid and her friends start playing with this toy. It is perfect for creative and interactive play since they can control the feeding and closing times of the park. Happy times! Now kids will spend a lot of time in their toy zoo. They will play with animals all day long. They will feed animals according to their schedule. They will even open and close the wildlife park as they like. What Does This Zoo Playset Include? The Playmobile Large Zoo playset contains a lot of accessories to make your kid’s visit to the zoo an exhilarating one. The animals came from all over the world. When a child visits the zoological garden, he will find a lion, lioness and two cubs as well as a zebra, elephant and a giraffe along with their babies. Two caretakers groom the pets. Aside from the animal pieces, there also are placards, enclosures, pillars, water stands, and trees. The inhabitants are jointed and controlling their movement would add fun and excitement to your kid’s play.